Wednesday mornings (9.00am) and Thursday mornings (10.15am) are Floor-based Yoga Classes led by our experienced yoga teachers Vanessa Krivickas & Maureen Germein. Become more aware of your body, breath, emotions and thoughts. This class covers joint movement, muscle strength and flexibility, breathing, relaxation and meditation. Places limited to ensure quality and safety. 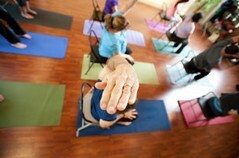 On Thursday evening there is a Yoga and Meditation Class at 7:30pm. Also led by our Maureen Germein.